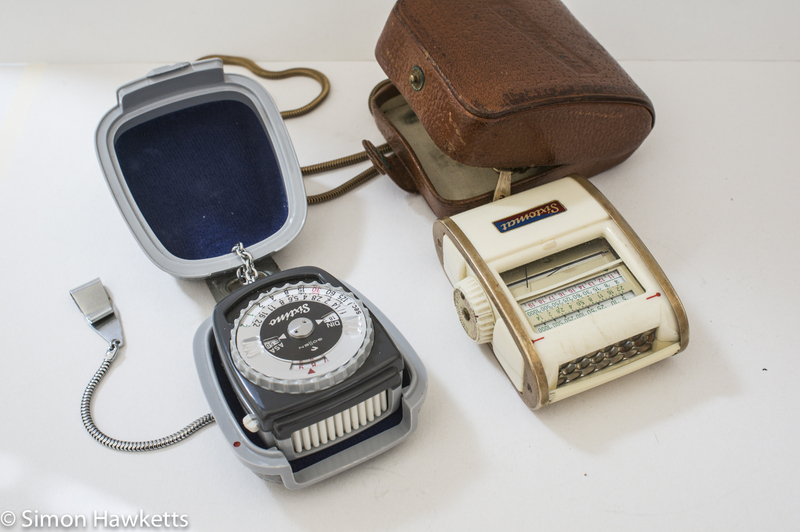 The latest additions to my vintage camera collection are not cameras at all but a couple of lightmeters. I have the Gossen Sixtomat which was a popular model in the 1950’s, and a Gossen Sixtino, a very small neat unit which was made about 1960. Both of these cost about £1 to buy from eBay UK. The Sixtomat unit is fitted in a tight fitting leather case with a brass chain which passes through a hole in the back of the case allowing the cased unit to be worn round the neck. It gives the impression that you could flip the case open and take a reading, but you couldn’t really do that – the unit needs to be completely removed from the case or the light cell is obscured. There is a blind which can be drawn over the light cell to allow the meter to measure incident light, or reflected light readings can be taken with the blind pushed over the back of the lightmeter body. The blind also acts as a cover for the meter glass when it’s rolled over the front of the body. Setting the film speed is accomplished with a small scale set into the knob which is used to take a reading, but on my copy this is incredibly tight and I found it difficult to move it more than a couple of clicks. This is made worse by the fact that the small button which is used to turn the dial is so small I couldn’t really get a grip on it. I suspect the stiffness may just be age – my unit is quite grubby and has seen better days. The measurement taking process is the same for both a measurement of incident light or reflected light apart from the position of the blind and lightmeter. For an incident light reading the blind is pulled down and the lightmeter is positioned near the subject and pointing towards the camera. For reflected light the blind is pulled up and the lightmeter is pointed at the subject from the camera position. Then, to take the reading, the knob on the side is turned until the angled line in the bottom window is crossing the position of the meter needle. The exposure can then be read from the scale above and is available in both Light Value (LV) and direct f-stop/shutter speed readings. The cross angled line on the display is a nice idea – it’s easier to see when the line is exactly aligned with the meter needle. On the back of the Sixtomat is the Gossen ‘color finder’ which is supposed to be used to find the temperature of the light so you could see how close it matched the film you had fitted. I’m not sure what purpose this served really. If you found it didn’t match did you wait until later in the day or change your film? This look more like a marketing gimmick to be honest. The Gossen Sixtino is a much smaller and altogether more modern looking unit than the Sixomat. It comes in a neat little grey plastic case and this unit actually is used when fitted in it’s case. In fact it is screwed into the case so you just flip it open and use it. Initially I found the case difficult to open until I discovered that when two little handles on the side are pressed together the case flips open. It has the same incidental or reflected light measuring capabilities as the Sixtomat so also has a movable blind to cover the light cell. My copy of the Sixtino is in much better condition than the Sixtomat and apart from some discolouration to the case looks almost new. In a way it’s odd that lightmeters can be picked up remarkably cheaply on the Internet auction sites whereas film cameras quite often seem to command very high prices. Lightmeters retain their basic function and can still be very useful, even with modern digital cameras having inbuilt exposure systems it’s still useful to carry one around for occasional use. You have quite the collection of camera gear!